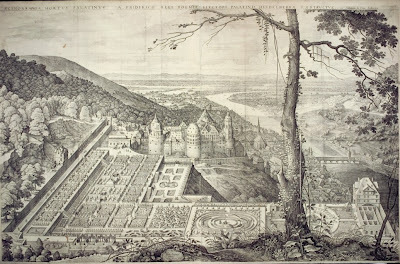 The Hortus Palatinus is one of the great lost wonders of garden history. Walking through it you would have been enveloped in a mysterious landscape of statues that wept, robotic birds that sang, mythical beasts carved into hedges, and strange symbolic patterns in the paths and groundscape speaking a garden language as lost as the garden itself. Some have interpreted it as displaying Rosicrucian symbology, but there is no evidence that Salomon had such leanings. He was a scientist and a polymath; a Leonardo-type character without the name recognition. In addition to his hydraulic engineering, he published treatises on perspective drawing (he was drawing tutor to Elizabeth's brother, Prince Henry who was England's great hope and whose early death from typhoid certainly altered the course of history), music, and sundials. He made what was perhaps the first modern greenhouse (it was at that time poorly understood that plants needed light!) was a pioneer of anamorphosis in art and an unsurpassed fountain engineer...his constructions moved and wept, organs played, birds chirped, and balls were suspended on jets of water in mysterious grottos. Within a year of its construction, Frederick and Elizabeth fled to Holland and the garden was destroyed in the Thirty Years War; it may even have been gone by the time Salomon published his treatise on it in 1620. Little is left now; one of the only remaining structures is the 'Elizabeth Gate', designed by Salomon and thrown up in only a night to celebrate Elizabeth's birthday. 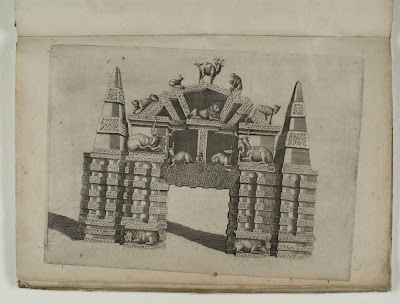 Ceremonial gates were terribly important in the Renaissance, a cultural obsession that often shows up in renaissance gardens. Fortunately, we can still experience the Hortus Palatinus because of the book Salomon left, which included detailed engravings. It can be viewed in its entirety online at the University of Heidelberg. The publication, by the way, was probably done for the resulting income...working for the king didn't always guarantee financial success. There were of course additional bills associated with the increased social standing of being a royal gardener, and gardeners often had to pay for at least some of the works/supplies out of their own pockets and then seek reimbursement from the treasury. The royals were notorious for being reluctant to pay their bills. 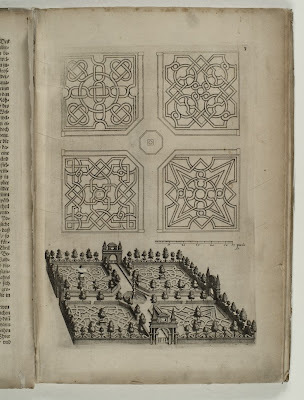 Note as you peruse the engravings that the garden is an 'assembly of parts', rather than a cohesive tableau, as we now expect a garden to be, and lacks the organizational axis that will soon begin to appear in Baroque gardens. Anyone want to collaborate on a virtual reality project? I loved looking at the engravings in the U. of Heidelberg text - they are magnificent. What a shame that the Thirty Year's War demolished the garden. It is great fun to imagine what this garden must have looked like. Sure - I'd love collaborating on a virtual reality project! !